Sponsoring an event at RISE® brings your innovations to a dedicated technical audience, establishes a rapport, and increases brand awareness and sales. please contact Joe Tessari at 919 459 3729, or jtessari@inda.org, . Sponsor Wi-Fi and every RISE® attendee will access the hotel internet energized with your company name. Wi-Fi sponsorship includes INDA produced and displayed signage with your company code. Connect your product's brand name or innovative technologies to all RISE® attendees for a full year. After the conference is over, your branded password welcomes RISE® 2017 attendees and purchasers to all RISE® Conference presentations for twelve months. Deliver your company message into the hands of every attendee - every moment of the conference with a Half page ad space (4/c) or a Full-page ad space (4/c). 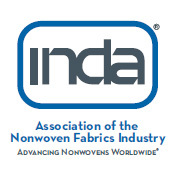 Reach the research and development, science and technology experts in engineered fabrics with premier advertising space on INDA's RISE® website. Every visitor to the RISE® website will see your digital advertisement, (digital box ad 300x250). Demonstrate your capabilities with your own :30 or :40 second video posted on the RISE® website. Showcase your company's messaging, product or service. Highlight your company during critical networking time. Scientists, R&D experts and technology scouts will see your brand during daily coffee breaks. RISE® coffee break-out sessions provide signage, coffee cup holders and onsite program directory recognition. Save travel costs. Share your PowerPoint presentation with hundreds of professional decision makers. Highlight your new product, technology or corporate message as the exclusive advertiser of three PowerPoint slides presented during technical breaks and sessions. Each slides receives a maximum :30 seconds per slide.